Our technician, Darren, is a survivor. He was treated for Hodgkins about 8 years ago, and is very involved in Relay for Life. He asked us if we would help him make a quilt for auction, so naturally – we said yes! 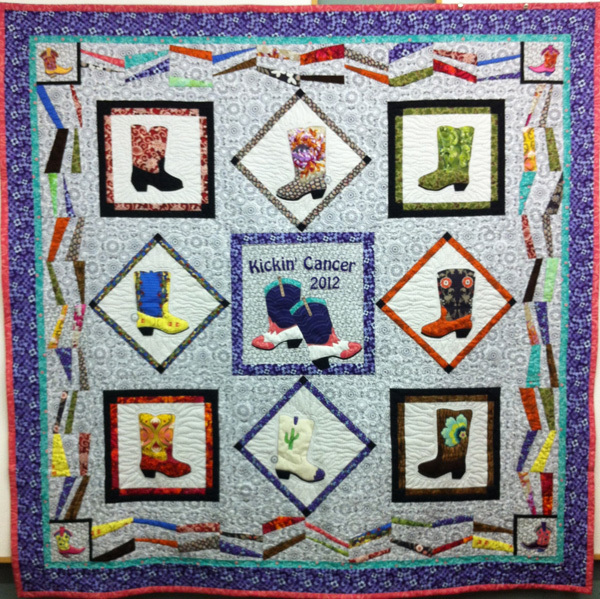 The theme this year is “Give Cancer the Boot.” Darren, who had never sewn or been near sewing until he started working here last August, fused and cut out all the boots. He also did the machine embroidery, both on the BERNINA 830 and the B 580. All of the employees worked on this quilt. One did all the blanket stitching, one did the machine quilting, and everyone worked on the piecing. It truly was a group effort!